The Koya are a tribe inhabiting the hills in the north of the Godaviri district and are also found in Malkangiri district They are said to belong to the great Gond family. The Koyas have a tradition that about two hundred years ago they were driven from the plateau in the Baster countary by famine and disputes. The Koyas are a Scheduled Tribes. Koyas are found in Kalimela, Podia, Malkangiri and Korukonda area of Malkangiri District. Koyas are the largest in population. In 1971 Koyas population was 58,730. In 1991 census their population was 1,40,000. By this time it has increased a lot. 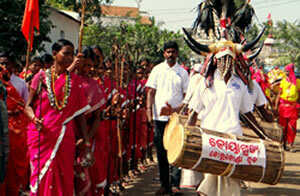 At Mathili and Manyamkonda area ancient Koyas tribes are generally found. Their village consists of 30 to 40 families. They don't settle at any place pernmanently because it's a belief that they may be some natural calamity or the local God will be displeased.